Our new “Hollywood At The Bijou” movie series “1939 the Golden Year of Hollywood – 80th Anniversary”. 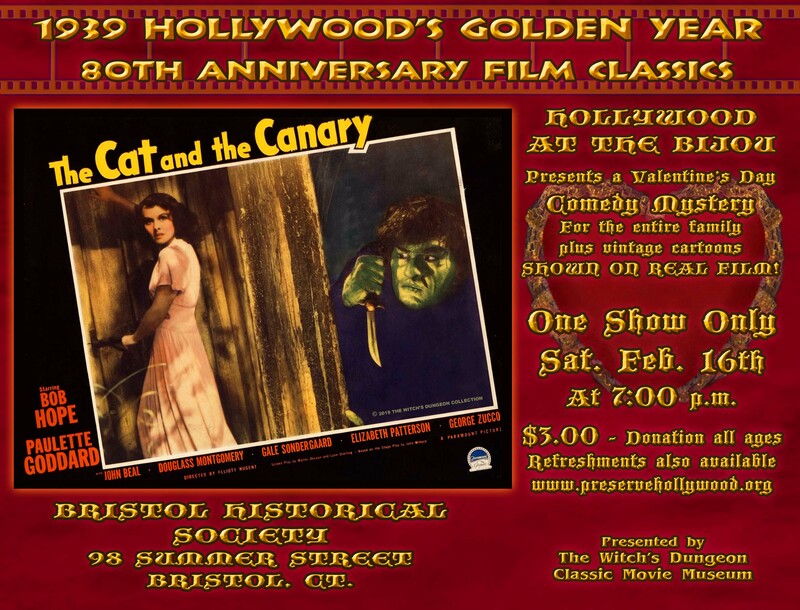 It is a year-long series of 11 classic films – all shown on real film, presented by “The Witch’s Dungeon Classic Movie Museum” with vintage era cartoons, each month at The Bristol Historical Society, 98 Summer Street in Bristol, CT. 860-583-8306. $3.00 donation each showing – popcorn & soda available. Our Valentine’s Day show: “THE CAT AND THE CANARY” (1939) starring Bob Hope & Paulette Goddard. A Romantic Comedy-Mystery – one showing only Sat. Feb. 16th at 7pm – plus a vintage “Popeye” cartoon, all on REAL FILM!